Where do I start? THESE GUYS ARE AWESOME!!! I’ve bought a lot of cars in my day but buying a car from Gulf Beach Auto was by far the best and easiest experience ever. They always have a great selection cars, trucks, and suv’s. With absolutely great prices. I can’t say enough good things about the staff, they are just the best!! I will definitely be buying another car from them, and I highly recommend anyone to go and see them, you will not regret it, I promise. I bought a 2007 Chevy Silverado...great experience! Bill was very helpful. I looked at a lot of other vehicles...they had the best deal I could find. Bought my first car here just two weeks ago, and I am so impressed by their honesty and willingness to help. TJ, the salesman who helped me find my cute little Rio, was always upfront and never pushed me to do something I was uncomfortable with. My car runs perfectly and the price was fantastic! Great service. Provided honest assessment of the car I was interested in. Highly recommend them. Used Auto Trader to find 3 car models under certain mileage. Gulf Beach Auto had 2 of them. Did homework before shopping, so we knew what a good deal they had. Bill was our salesman and Igor was the manager. Both were upfront and honest. Cars were immaculate. There was a problem with the seat control and they fixed it before we closed. We already had the financial side worked out prior to going, so this was an easy deal. They were great, and we would go back. Very happy! Thank you, guys! PS I do not work for them. Also, they explained what a rebuilt title was and they followed the state law for disclosure. Still happy with the car we researched and bought. I am writing this review because I typically do not like going to dealerships to purchase a car because it’s usually never a fun experience when you have to deal with people that just want your money. However, working with Bill was absolutely fantastic. He went above and beyond by getting me in and out of the office within 30 minutes to finish the deal. Furthermore, once the deal was done instead of getting ready for his next sale and getting me out the door he spent probably an additional 20 minutes to offer me some really good advice regarding something personal I have gone through in my life that he has also experienced and I really appreciated that. So, if you are looking for a really nice car and great people to work with then you need to go to Gulf Beach Auto Inc where they really do treat you like family! Thanks again to the staff at Gulf Beach Auto! Very easy going and friendly service, no pressure to purchase anything. I bought my Nissan quest here for 12k and it's worth 16k easiest car buy ever and I hate car shopping. Done with paperwork in thirty minutes and i was off the lot! Replaced my car fab with new battery and helped me with tag purchase! Totally recommend buying any car or van with them! For a good selection and great prices check them out! Bill & Steve work hard to give you a good experience. I'm starting my career in real estate and needed a new vehicle to drive clients around. I was driving around a 2008 Honda Accord that was a bit of an eyesore due to minor scratches and dings acquired over the years. I saw a 2015 BMW 328i on Autotrader that caught my eye. The price was too good to be true, for clean retail that is. I come to find out that Gulf Beach Auto specializes in rehabilitating salvaged vehicles (autos deemed a total loss by an insurance company) into rebuilt vehicles. There are a lot of mixed opinions on rebuilt titles, and there are some caveats to be aware of. Financing and insurance options will be more limited that a vehicle with a clean title. Although USAA financed, and Geico insured my rebuilt. Both rates were pretty good. I worked with TJ on the deal and he was really accommodating in the transaction. Now on the car. At first glance, you would never know that the car had been in any kind of accident. Gulf Beach Auto has a good sized repair facility behind their lot, and there is no doubt their auto body specialist and mechanics are skilled. I had my family mechanic check out the vehicle in depth and he regarded their repair work highly. Purchasing a rebuilt title may not be for everyone. In my specific case, A). I like cars and wanted something cool to drive that wouldn't break the bank. B). I have to drive clients around and project an air of success (superficial, i know). It worked out great and I got an awesome vehicle by taking this alternative route to buying. Gulf Beach Auto made it happen. I needed quite a cheap solution for just a couple of months that I will stay here in Pensacola. I got a very nice 2007 Chevy Impala without any issues from Gulf Beach Auto. Overall they were cooperative and helpfull. I would buy there again. Gulf Beach Auto made buying a car not only painless, but pleasant! I had a great experience and plan to continue to do business with them in the future. Thank you for saving me thousands and putting me in my favorite car! "I had a great experience working with Gulf Beach Auto . While I did a lot of research on my own prior to visiting to ensure that I was getting a car that I would like, Glib and Igor were very helpful in answering my questions and making the buying experience easy and comfortable. . I feel like I made the right decisions. Despite this I feel like my experience at Gulf Beach Auto Inc matched the recommendations I had been given, and I will definitely recommend it to other people." We recently purchased a minivan with them and were pleased from start to finish of the process! Honest people and very friendly. I am loving my mom van and our little one loves her "red bus". Will definitely do business with them again when the need arises and they have what we need. You can't go wrong with this company. Awesome cars, great Prices i highly recomend Scott Mancuso he treated us very well! The best experience ever! Thanks to the Gulf Beach Auto team! Took fantastic care of us! Great experience buying a car at Gulf Beach Auto!! My husband and I purchased a 2015 Chevrolet Malibu a year ago and we love it. It still works perfect!! We recommend Gulf Beach Auto to all of our family and friends!! Scott was awesome to work with. The guys at gulf beach auto are awesome, I'm a first time buyer and they made sure to walk me through the process. When I couldn't get the car that I originally wanted they kept trying until I was in a car that I was satisfied with. Thank you guys! I bought my car from the owner Igor and it was truly a pleasant experience. Where I got a quality used car at a very reasonable price.The next time I am in the market for a vehicle I will for sure come to Gulf Beach Auto. 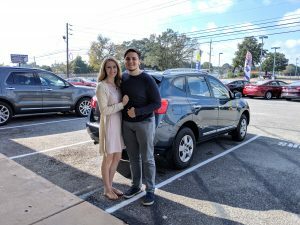 I bought a car from Gulf Beach Auto and it was a great experience! I started seriously shopping for my car with saved searches in Autotrader and eBay. I knew what I was looking for and what I should spend. Gulf Beach Auto beat my best year x mileage x price by at least $3k. Their business model is a good one and they have found a niche serving people who don't want to pay full retail. I'll definitely shop them again. Had a wonderful experience here two times now! If your looking for a great vehicle and people this is the place to go. If there was a way to give this place a 8 star rating I would. The car is/was beautiful for an unbelievable price. I paid cash and had my car, title and everything else I needed delivered in less than 3 days all the way to Mississippi. TJ was my point of contact and he made life crazy easy after I had a terrible first time experience buying a car. This was nothing like that. The time it took me to test drive and sign all the paperwork and all of that stuff had to be about 35 mins total. Tj told me to time him it wouldn’t be less than 15 mins on the paperwork side I think it was exactly 15 mins. Then Steve was awesome and fast in making sure all the paperwork was right and I got my best deal. Recommend for sure if you’re looking for a great deal! If anyone is looking for unbelievable auto deals, you must go see Glib from Gulf Beach Auto now. The car price tag was nice and important but it was the unexpected honesty and straight answers from the get go that truly sets Glib and Gulf Beach Auto apart. Thank you Glib! Purchased my first car with them this week. I dealt with Bruce. Overall a great experience, very professional and honest people with low prices. Definitely would recommend them!! Thanks to Gus we now have a 2014 honda civic! He went above and beyond (even after purchase) to make sure we were well taken care of. We will be buying from him again soon. Thanks for the awesome deal! 10/10 would recommend. No Bull and straight out the door with no hidden fees or gimmicks. T.J. was very insightful and truly helpful for my buying experience. Scot gave us a great deal on my daughters first car. Scot was the best . Thank you for all your help . Great experience !! 2nd car bought there, will buy another!!!!! Saw car online, test drove it, completed paperwork, out in less than 2 hours! Quality car, the salesman TJ was no pressure and VERY nice, and can't wait to buy my youngest daughter her car there. Love this place. Thanks TJ!!!!!! Great place to get a car! TJ was so helpful, he made my first car purchase so easy and comfortable. They’re all very kind and helpful and will answer any questions you might have. I absolutely LOVE my 2014 Kia Optima LX i got from here! Will be recommending all my friends here! My husband & I purchased a 07 Nissan Altima from them and we love it. We had a great car buying experience, their was no haggling or pressure to buy. They have nice used vehicles at great prices. We definitely plan on purchasing more vehicles from them again in the future. Come in and talk to Gus or Glib they are great! My wife was looking for a car for three months and finally found what she wanted and needed at Gulf Beach Auto. Great service from a great team got her taken care of and rolling in no time and with no hassle. Appreciate all the help! This was my first vehicle I have ever bought and Scott made the process efficiently. The office layout does not leave the best impression but their inventory and employees make this business what it is. When I need another vehicle in a few years. I know where my first stop is. P.S. Scott followed me home and gave me a ride back to get my old vehicle past closing time for the business. Above and beyond service. Great experience and great price on my new truck! Thanks Scot! T.J. and Igor are great and easy to work with. We saw the car online and they made most of the deal over the phone. There was no hassle and a good price. What a great car buying experience! TJ and Steve made the process fast and easy. Amazing prices and customer service! Great experience! Quick and easy sale! Second car I’ve bought from Igor, not a single problem! Always helpful! Always reliable! Best car place in town if you wanna save money! Call and ask for Igor and let your vehicle trouble melt away! My next vehicle will also be from here! Best place in Pensacola! Great service. Really friendly folks. And I got a great vehicle! Great vehicles. Best prices to be found. Customer service is top notch. I recommend them to anyone. Fantastic experience. My husband and I work very different hours and they accommodated our busy schedule, we're helpful and really made the process easy. Bill was great to work with. Thank you. Recommend them to anyone. I must say going to a dealer to buy a car is not at the top of the list of fun things I like to do. However, I was very pleasantly surprised by the friendliness and helpfulness of the sales staff at Gulf Beach Auto. Buying from Gulf Beach is truly the only time buying a vehicle has not been annoying for me. If you are in the market for a car and want a friendly, hassle-free experience you need to stop in at Gulf Beach Auto. Scot Mancuso is very professional. He is straightforward and does not play games. He is very knowledgeable and works hard to earn your business. I had been searching for a great, reliable used car for 7 months, but due to my recent credit hit after buying a house, the dealerships and banks could not get me approved for the loan amount I needed to finance the vehicles I had chosen. The banks were skeptical and referred to my situation as a "liability". I had decent credit well above 600 and no bank would take a chance until i ran into Gulf Beach Autos Inc. The staff I encountered throughout the buying process was exceptional. I worked personally with TJ and Igor, and both of them were extremely knowledgable about the 2017 Nissan Altima I had picked, and even more helpful when it came to bank information. I loved the experience I had at this dealership and will more than likely pick up another vehicle from here next year. 5 STARS! Loved my car buying experience. Bill took great care of me, didn't blow smoke, and kept it real. Got the vehicle I wanted for thousands less than anywhere else. Would recommend. Thanks for your Help Scott, we love our car!!! This was the best service we have ever received from a car dealer. TJ and Steve were awesome. I enjoy the vehicle they have awesome prices and they are willing to work with you!!! Scot Mancuso is the best. He gave me a great deal on a new car. Great experience, got exactly what I needed with no problems. I am not one to enjoy car shopping. I had a wonderful experience with Gulf Beach Auto. Scott answered all our questions and didn’t pressure us into the purchase. I highly recommend them to anyone looking to purchase a nice car. Bought my Nissan Altima from here 3 years ago and just sold it for almost for what i paid for, very pleased!!! Wished they had a car i am looking for, Thank you anyway!!! I just had a wonderful car buying experience here. Bill was able to go through the car with me and my wife in not the best of weather. Their knowledge and willingness to work any issue we may of had is a testament to their customer service. Please stop on by, talk to Bill. He most definitely earned our business. There is a reason why they have such great ratings. My experience with them was amazing. The staff were great to help me find my dream car. Also, it holded the car with the deposit for me even though there was a lot of people interested and I was going to be able to travel there one month later. The car was in great shape just like it was in the website. All the cars that this company sells are in great shape. The selling process was nice and fast even though I was from another state. All the papers arrived on a great time manner. Next time I decide to trade my car, the Gulf beach auto will be the first place that I will contact. I definitely recommend this company. We purchased a car for our daughter here on the recommemdation of a friend. The salesman was super nice and very patient. We got a great deal on a car with low miles. Very happy with the service and the car! Very friendly helpful and fast! A very good selection of used cars to buy. Had a great experience. They were very open and great about everything. When it came time to closing cost, there were some prices that were not mentioned to us, so they ended up cutting off about 50% of the cost of the additional fees which I thought was pretty stand up. I went to Gulf Beach Auto to buy my first car. I have to say it was a very pleasant experience! They made my first ever car shopping experience a pleasant one. They had a variety of really nice cars at an affordable price. All the employees were very helpful and answered all my questions without hesitation. After I picked what car I wanted and the deal was done, their assistance didn’t stop there. They continue to make themselves available if I have any questions or concerns. I would not hesistate to go back there in the future to purchase another car. Best place to go, hands down! We have bought two vehicles from this dealership both were great experiences. They are completely up front about their vehicles and their business. Scott was great, helped us get an amazing Ford Focus for a great price. Had a great experience. Bill was knowledgeable, professional, and friendly. Test drive to final purchase was under two hours. They advertise "save thousands" and we did. I would definately buy another car from them. Sincere thanks to Bill and Igor. I made a great purchase at Gulf Beach Auto Inc. Scott Mancuso was up front and honest about the vehicle he was selling me. I'd like to thank him and his team for taking care of me and sending my paper work in a timely manner. Thank you all! Gulf Beach Auto is great! My old car died and I needed a car quick. I found a great car at a great price so I went in. They were super helpful and helped me set up everything so I could get the car that day. As long as I live in the area, this is the only place that I will buy a car. Igor is the man and willing to work with you no matter what condition your trade is in. Great prices and great inspections on all their vehicles! Got an excellent deal on a very nice car. Thank you to Gus and all the sales folks are very professional and honest and easy to deal with. Will definitely buy from them in the future. Excellent customer service. Clean cars. Great prices. This place is great! I got a great car for a great price. These cars have rebuild titles, thats why they are so cheap. However you would never guess they are rebuilds. I am happy with my car and I told my friends to head on down to see what they can get. I have purchased 2 vehicles from Gulf Beach Auto. Both of the cars were about one half the cost if I had purchased them new. Both looked and drove like they were brand new. The fist car I kept for 3 years and sold it for what I bought it for. The second car I still have and still looks and drives like new. Overall, I am very pleased with the service here. The sales man, TJ (look for him) was honest with my questions. They even provided great tips on getting the best interest and worked with me on pricing. Truely an alternate experience. Great purchase, great savings. I will recommend to friends and family. 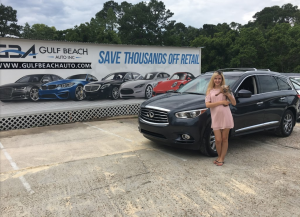 I had a great experience with Gulf Beach auto! From the first phone call, through to the signing of documents, all was clearly explained and understood. I had some unique requests, and for all that I requested, i was truley satisfied. Glib was extremely considerate of my needs, and he came to the table with a great attitude. This was a great experience for me. I would recommend Glib of Gulf Beach auto to sell and organize the details of any vehicle on the lot. Thank You Gulf Beach Auto! You certainly have a truley unique presence in the industry. I love my new 2015 nissan altima, great customer service!!! 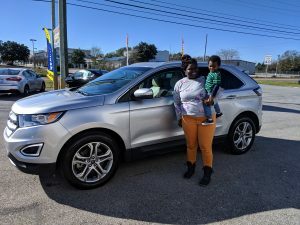 I had a really good experience as a first time car buyer here at Gulf beach auto everything was easy , the people here are great, friendly and they'll also help you along with the car buying process. I know my biggest fear was making a mistake or doing something incorrectly but that was not an issue I was assisted 100% of the way if you ever feel unclear or unsure about something just be sure to ask and they wont mind explaining or going more in dept. Ask for GUS! Very professional, quck and easy. I never felt pressured or over-whelmed. They answered all my questions and helped me out with everything else. Couldn't have asked for a smoother experience when trying to buy a car. Thanks again team and Gulf Beach Auto! The best car buying experience I’ve ever had. TJ wasn’t pushy to purchase a car, answered all the questions that I had, and made me feel very comfortable in each test drive. Extremely dedicated to helping me find the right fit. So glad that I purchased my car from them. Steve made us feel so welcome and got us the best warranty that fit our needs. Great to service members too. After watching my 2004 Trailblazer burn to the ground the last thing I would have needed was high pressure salesmen hackling me. TJ and Steve are the complete opposite of what you experience at large car dealerships. They were honest about my new Vans history and it was immaculate. If you want to be handled with respect this is the place to go. The best perk the van looks brand new inside and out and is only 4 years old. Everything works awesome! Scot gave me a great deal on my car! My daughter and I purchased a car from Gulf Beach Auto Sales last week and I must say that this was my "Best" experience ever. From the moment we entered the dealership, Scott made us feel like we were family and if he sold us a car that would be great too. Scott, our salesman, was extremely patient, compassionate, but more importantly, he was honest and trustworthy and that sealed the deal. I would give Gulf Beach Auto Sales 5 Stars but if I could, I would give "Scott" 10 Stars" I'll be back for my next purchase. Thank you Scott and the Gulf Beach Auto team from the Maxwell's.